Episode 2 of our Communal Property Essentials Series -What is the Management Committee. In this second episode of our Communal Property Essentials series, I discuss what is a Management Committee. What’s its purpose, who can be on it, who should not be on it, why its so important & what its number 1 duty is. ​What is a Management Committee? In the last episode of the Communal Property Essentials Series I discussed the core subject of What is communal property and who is responsible to manage and maintain it. If you missed that episode you can find a link in the description below. In that episode I mentioned that it would be extremely difficult for every owner to have a say on each small decision. Instead each year your buildings unit owners should elect a small group of individuals to make these day to day decisions. This group is called the management committee. If you have owned an apartment outside of Cyprus with communal spaces you may know this as a Home Owners Association, resident’s association or maybe a condo board. But whatever you call it, its effectively a group of people who are put in charge of the operation and maintenance of the shared parts of the building. The rules for management committees vary around the world. In Cyprus they are responsible to co-ordinate the entire operation, maintenance and management of the shared parts of the building. This will include doing any admin, creating the budgets, collecting payments from the property owners, organising the maintenance, repairs, dealing with suppliers, utilities and contractors and so on. Most committees are made up of volunteer owners and sometimes tenants who donate their time and expertise free of charge. I will be honest, being on the committee can be very time consuming and can require a high level of knowledge and experience in Accounting, Maintenance and Project Management depending on what role each committee member is assigned. While they are volunteers it must be kept in mind that this is not a committee for a bake sale or some event at your local school. It’s important to always keep in mind the members of the management committee are placed in charge of what is usually Millions of euros of property. They are responsible for managing large budgets, cashflow, operations and generally some quite challenging and frustrating situations. And they must do all this while making sure they don’t accidentally fall foul of the many legal regulations on property in Cyprus. I cannot emphasise enough how important the decision is on who to put in these trusted positions. Now after I may have scared off anyone thinking of joining their committee, being on the committee may have lots of challenges but it also has one massive positive. You get to remain in control over your property, you get to guide the way the building is managed and safeguard your property investment. Think about it, if your hard work prevents your property dropping 50% of its value because the site was so poorly managed you cannot get a buyer, then the time spent on the committee was worth it. Can the committee Get help? 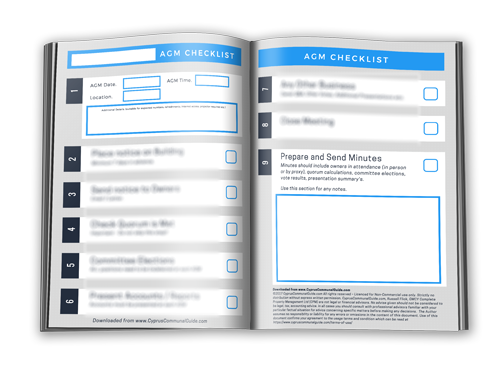 Committees are made up of volunteers with limitations on their available time and may not have the experience or training required. 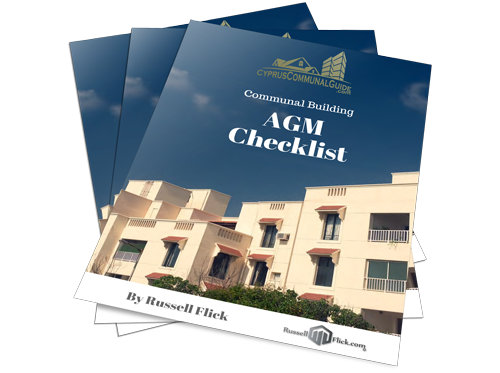 So most committees will hire a professional communal property manager to deal with the day to day operations. This is all permitted under the regulations and its suggested for any building where the committee does not have the time and/or the experience to self-manage their buildings. Even when a communal property manager is hired, the committee are still in ultimate charge of the building and are the only ones with the legal right to make a decisions on behalf of the owners under the property law. Legally you cannot have a property manager if there is no committee in place, as unless they are working on behalf of the committee, a property manager does not have any legal powers under the property law to operate the building or collect the money. This is not a black or white question to answer. Under the law a committee must have at least 1 member, and a maximum of 5. If your committee has 3-5 members anyone can be elected by the property owners, this could be an owner, tenant, lawyer or a professional. As an example, I am commonly requested by my clients if I can be on their committee as a consultant. This is not a problem, providing any conflict of interest is removed. So for example in those committees I would not be permitted to be involved on any decision regarding any services my company provides. OK so that’s the case if you have 3-5 members, but if you only have 1 or 2 people on your committee, then under the law they both must be unit owners. It can be tempting the elect anyone who is willing to put their hands up, with the theory that any assistance is better than none. Ideally anyone joining the committee will bring relevant skills or experience, and have a vested interest in the success of the building. You must try to avoid negative or argumentative individuals along with individuals who only wish to serve their own interests. A unit owner who is not paying their communal fees or is in arrears cannot vote at any general meeting of owners. The law sets this rule to make sure that owners who are not fulfilling their legal obligations cannot make decisions that effect that building or decide where other unit owners money is spent. So while a unit owner in arrears is not specifically excluded from being on the committee under the regulations, I do think its unwise to vote them onto the management committee. But what do you think maybe you think under certain circumstances owners in arrears should be voted onto the committee? Let me know in the comments below. If you have a copy of ‘The ultimate committee handbook’, you will see I dedicate a large section to how to setup a committee, who can and should be on the committee, how to deal with conflict of interest and generally how to increase the efficiency of the committee. I also go through what you can do if you have a dysfunctional committee or suspect foul play. If you don’t have a copy, I will include a link in the description below where you can get one. 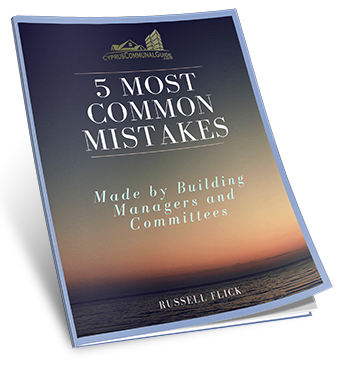 As I am sure you can imagine I deal with a huge number of management committees, and I have encountered many really good committee members, and lots of really bad committee members who seem to do everything possible to stop anything good from being done. You want a constructive, positive committee, so when you are looking for good candidates look for positive owners with something to contribute. It is always best to have a specific position to fill with a clear outline of the expected roles and responsibilities of that role. So if you have someone who is an accountant would be ideally suited for a treasurer. A building contractor may be best suited as a maintenance project leader and so on. 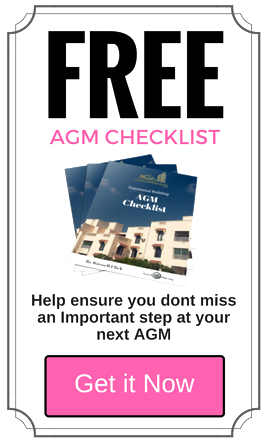 The committee are the most important part of your building, and it should be protected. Sometimes you may think that it’s a good idea for that ‘pain in the behind’ owner to join the committee and see what you deal with the hope they will get a moment of enlightenment and will all of a sudden realise that you were right all along. In my experience this unfortunately rarely happens; put simply, unreasonable people cannot be reasoned with. What will more than likely happen is they will continue to disrupt the committee at every stage but from the inside rather than the outside. I know this sounds harsh, but this is possibly some of the best advice I can give you. You could have a single person join the committee that is so antagonistic, disruptive argumentative and negative at every stage that eventually one by one all the good members resign in frustration. Then this negative member fills the committee with people of a similar mindset and within months can take a development from the best in the area, to a near derelict site with empty bank accounts. If it sounds like I am talking from experience, I am. And not just once, this is unfortunately commonplace. I know many people watching this episode right now will be nodding their heads as I will have described what happened to their building. If you agree this is a bad idea please feel free to let me know in the comments below. And if you don’t agree and had a different experience let me know as well, honestly, I would love to hear that this is not always the case, but I would go on record to say it’s the majority. We have covered what the management committee are, and who can and should be on it. Now I need to say what in my opinion is its most important duty. It may surprise you, but I think the most important duty of the committee is the setting of the budget. Most buildings set their budgets a year in advance and if they calculate this budget incorrectly or don’t plan for the unexpected a building can quickly find itself in a cash crisis. This can result in the committee needing to cut service levels, skip important preventative or even emergency maintenance. Or worse they need to go back to owners in the middle of the year asking for more money, which is rarely a pleasant task. So how can a committee make sure they set a accurate budget, well I am going to cover that exact topic in the next episode of the Communal Property Essentials Series.